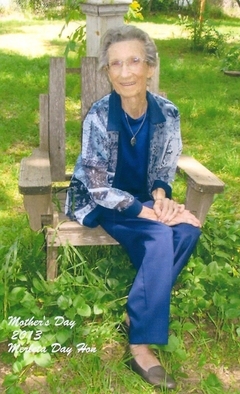 Boyd ~ Merleta Hon, 90, a retired grocery store clerk went to be with our Lord Tuesday, July 15, 2014 in Boyd. Memorial service is 2:00 p.m. Friday, July 18, 2014 at Trinity Baptist Church in Boyd. Rev. Charles Day will officiate. Merleta was born on May 25, 1924 to Homer and Eva (Taylor) Porter in Winters, Texas. She was preceded in death by her parents; her first husband, William Day in 1959 and her second husband, Frank Hon in 1976 and her brother, Billy Jack Cunningham. Those left behind to cherish her memory are her daughter, Carol Waldrop and husband Lee of Boyd; her son, Charles Day and wife Patsy of Decatur; 4 grandchildren, 10 great grandchildren and 6 great great grandchildren; her step daughter Martha Roberts of Abilene; other family members and a host of friends.